H.D. Wires stands by its claims: “We just don’t draw wires, we draw customer satisfaction” and committed to quality and timely delivery. On 16th of March 2019, H.D Wires will celebrate its 25th Anniversary in Indore. It is one of the leading manufacturers of G.I wires, cable armour wire, stay wires, earth wire and cable tape in India. It is an ISO 9001:2015 company and is being acknowledged as eminent name in India as manufacturer and exporter of end to end GI wires and other wire products. H.D. Wires stands by its claims: “We just don’t draw wires, we draw customer satisfaction” and committed to quality and timely delivery. Today they are the major manufacturer and supplier of various products that are also complied with IS, BS, ASTM and other international standards as per the requirements of the customers. The company has also received the approval from Power Grid for supply of GI wires and ACSR wires. H.D. 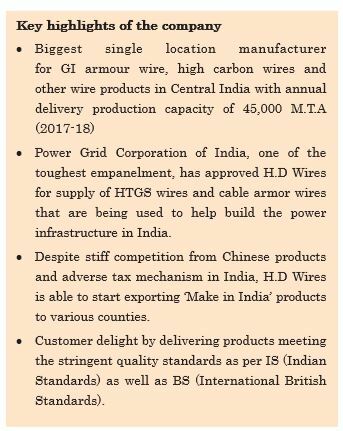 Wires is supplying cable armour to some of the top cable wire manufacturers in India like Polycab, Havells, Ravin Cables, UCL, Finolex, KEI, and Apar Industries. Next articleWhy not use the synergies?